(From Canon lens literature) A highly practical medium telephoto lens with superb delineation and portability. Images are sharp and clear at all apertures. Through computer simulations, the lens has been designed to give beautiful background blur. Since the front lens group does not rotate during focusing special filter effects are not affected. Prime lenses in this focal length range have always been great choices for portrait photography, because of the tendency of the moderate telephoto focal length to slightly "flatten" facial features, avoiding the problem of too-big noses in frontal shots taken with wider-angle lenses. In the digital era (at least with sub-frame cameras), the 85mm focal length of this lens gets a little long for that usage (you'll end up having to stand off quite a distance from your model), but the favorable effect of a long focal length continues to make the attractive choices for that sort of work. In fact, the Canon 85mm f/1.8 USM seems to be almost ideally suited for portrait shooting, as its very wide aperture really helps to blur out distracting backgrounds, and its soft corners (which might otherwise be considered a defect) can help to isolate a portrait subject near the middle of the frame. While far from a perfect optic, the 85mm may be one of the better portrait lenses on the market: Read on below for all the details from our testing. Be sure to check out the Blur Viewer shown to the right of this report, which shows the detailed blur performance of this lens on our sub-frame Canon EOS-20D body. The plot first displayed when you bring up the viewer (f/1.8) reveals a slightly soft center and softer corners. As you move the aperture slider to show performance at smaller apertures, you will notice that the center sharpens a bit while the corners sharpen more, until the plot becomes relatively flat at f/4; then remaining so throughout the remainder of the aperture range. The Full Frame (5D) Blur Viewer reveals even softer corners on the 5D, a result of the larger sensor capturing corner detail much farther from the center of the frame. These observations will be expanded upon in the two sections (Center Sharpness, Corner Sharpness) immediately below. Center Sharpness for the Canon 85mm f/1.8 on both the Canon 20D and 5D are shown in Figure 1 to be very similar. Using DxO's Blur Scale, the center portions of the images are "Sharp" in the f/2.8-f/16 range. Diffraction degradation renders the f/22 centers to be "Slight Blurred" for this lens. At f/1.8 and f/2, the images are also "Slightly Blurred". All in all, the Center Sharpness for the Canon 85mm f/1.8 lens is very good. While Center Sharpness is very good for the Canon 85mm f/1.8, Corner Sharpness at wide apertures is not! Figure 2 reveals this only too well. At f/1.8 and f/2, the corner performance shows excessive blur on the 20D and the 5D. And at f/2.8, corner performance on both bodies gets a "Visible Blur" raring. From f/4 on, Corner Sharpness on both bodies falls in the "Sharp" to "Slightly Blurred" range. Summarizing, Corner Sharpness for the canon 85mm f/1.8 lens is poor at the wider apertures and satisfactory thereafter. On the Canon 5D, the Canon 85mm f/1.8 lens exhibits quite acceptable Chromatic Aberration, while the CA performance on the Canon 20D is more nearly average. The Chromatic Aberration characteristics of the Canon 85mm f/1.8 lens are perhaps slightly better than average overall. The Distortion values for the Canon 85mm lens on the sub-frame 20D body are excellent ("Not Perceptible" rating by DxO). The full-frame Average Distortion is also excellent while the Maximum Distortion on the 5D is in the "Visible by an Expert" category according to DxO's ratings. The Canon 85mm f/1.8's Distortion performance receives an "Excellent" rating. The Canon 85mm f/1.8 USM lens auto focusses quietly and quite rapidly (less than one second) from the closest-focus lens-to-target -- distance of roughly 74 cm to infinity. At closest focus, the image spans a horizontal distance of 18 cm, so this clearly isn't to be considered a macro optic. The Manual Focus ring is comfortably wide, works very smoothly, and is functional in the AF mode. (This is a nice feature of lenses with USM motors, you can tweak the focus manually at any time, without having to explicitly switch to manual focus mode.) The AF operation of the Canon 85mm f/1.8 earns an "Excellent" rating. The Canon 85mm f/1.8 has a very solid build, albeit perhaps not quite up to that of an "L" lens. Its balance on both bodies resulted in a very comfortable hold. Despite its very large maximum aperture, it isn't a particularly heavy lens, and it seems relatively short for its focal length. The Canon ET-65II lens hood (an accessory) is light and relatively large, a great help in avoiding flare from near-frame light sources. The Canon 85mm f/1.8 is a well-built, good-quality lens. We will compare the Canon 85mm f/1.8's performance with that of its "big-brother", the Canon 85mm f/1.2L; two "sibling" Canon lenses, the Canon 50mm f/1.8 and the Canon 100mm f/2.8; the excellent Canon 70-200mm f/4L IS at 70mm; and the Tamron 90mm f/2.8. At the end of the line identifying each of these lenses, we show a typical street-value price to compare to the $340 price for the Canon 85mm f/1.8. In these tests, all lenses were mounted on the Canon 20D. The Canon 85/1.2 II is one of the sharpest lenses overall that we've tested, with excellent performance across the board. It's a little soft wide open, but center sharpness is very good by f/1.4, and even the corners aren't too bad-looking. It's clearly an "ultimate" optic in its focal length range, but is priced accordingly. The Center Sharpness curves of Figure 5 for the Canon 85mm f/1.8 and its "big brother", the Canon 85mm f/1.2L, indicate that the more expensive f/1.2L does indeed outperform the f/1.8 at the widest apertures, particularly those below f/2.8. (Note that the "gap" in the f/1.2L results at f/1.8 is because we did not shoot that lens at an f/1.8 aperture setting.) From f/2.8 through f/16, the f/1.2L still outperforms the f/1.8 in Center Sharpness, but the difference is "not perceptible" according to DxO. Similarly, the f/1.2L significantly outperforms the f/1.8 in Corner Sharpness below f/2.8, and exhibits only slightly better (but nonetheless excellent) corner performance from f/4-f/16. Figure 6 reveals that the Canon 85mm f/1.2L is slightly better than the Canon 85mm f/1.8 for Average (overall) Chromatic Aberration; while it (the f/1.2L) significantly outperforms the f/1.8 in the Maximum Chromatic Aberration results. This is because chromatic aberration in the f/1.8 lens is mostly confined to the corners of the frame. The Shading graphs of Figure 7 show very similar Shading for the Canon 85mm f/1.8 and the Canon 85mm f1.2L. Even so, the f/1.2L does slightly better than the f/1.8 below f/2.8. The Canon 50mm f/1.8 II is one of the best bargains in the entire Canon line. A dirt-cheap "plastic fantastic" (referring to its lightweight body construction), it delivers surprisingly good performance when you stop it down a little. Selling in the range of $80, it's a lens that belongs in every Canon shooter's kit. The Center Sharpness curves of Figure 8 for the Canon 85mm and the Canon 50mm indicate very similar Center Sharpness performances by the two lenses in the f/2.8-f/22 range. At f/1.8 and f/2, the 50mm lens is just perceptibly sharper in the center than the 85mm. The situation is much the same for Corner Sharpness, where the two lenses are essentially identical for f/4-f/22, while the 85mm lens has significantly better corner performance at f/1.8-f/2. The Canon 85mm f/1.8 exhibits significantly better Chromatic Aberration performance for the wider apertures, f/1.8 and f/2. But for apertures f/4-f/22, the 50mm lens is a significantly better CA performer than the 85mm. The Canon 85mm f/1.8 exhibits better Shading performance than that of the Canon 50mm f/1.8 over the entire aperture range of f/1.8-f/16. While this is true, the more-or-less uniform difference of 0.05 EV is probably not perceptible to even the most trained eye. The Canon EF 100mm f/2.8 macro is an excellent lens, very sharp, with low distortion as well. It's the lens we use for much of our testing of Canon bodies at Imaging Resource. Both Center Sharpness and Corner Sharpness for the Canon 85mm f/1.8 and the Canon 100mm f/2.8 are essentially identical over the f/2.8-f/22 aperture range the two share. The Maximum CA and Average CA performances by the Canon 85mm and Canon 100mm are not significantly different over the f/2.8-f/22 aperture range they share. Shading by the Canon 85mm f/1.8 and the Canon 100mm f/2.8 is the same over the f/4-f/22 aperture range. The higher shading by the 100mm lens at f/2.8 is significant, but not unexpected, as most lenses exhibit increased shading at their widest aperture, as does the 85mm at f/1.8-2. Center and Corner Sharpness by the Canon 85mm and the Canon 70-200mm @ 70mm are essentially identical. The poorer Center and Corner performances by the 85mm occurs primarily for f/1.8-f/2.8, below the f/4 minimum aperture for the 70-200mm lens. Over the f/4-f/22 aperture range shared by these two lenses, their Average CA performances are indistinguishable. The Canon 70-200mm does exhibit a midrange f/4-f/11 Maximum CA that is slightly better than that of the Canon 85mm f/1.8. Shading by the Canon 85mm and Canon 70-200mm @ 70mm lenses is very good for both lenses in the f/5.6-f/22 range. At f/4, the 70-200mm lens does exhibit exaggerated Shading as does the 85mm at f/1.8-2. That said, the Shading performances by the two lenses are quite acceptable. This is a macro lens from Tamron that competes very favorably with the ~100mm macros from various manufacturers. In Figure 17, the Center and Corner Sharpness for both the Canon 85mm f/1.8 and the Tamron 90mm f/2.8 are essentially the same. Each lens shows a typical increase in Sharpness at its lowest aperture. 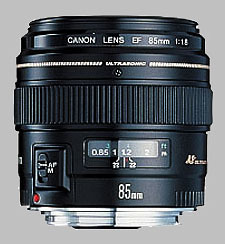 In Figure 18, the Canon 85mm f/1.8 exhibits a better CA performance at f/2.8 and f/4 than that of the Tamron 90mm f/2.8. Over the remainder of the shared aperture spectrum, the two lenses have essentially identical CA performances. In Figure 19, the Canon 85mm f/1.8 has a better Shading performance than does the Tamron 90mm f/2.8. Even so, both lenses have quite acceptable Shading performances. At this time, we have not yet tested these lenses. Maybe soon? Table3. Summary of the Comparison of Canon 85mm f/1.8 with five other lenses. The content of Table 3 indicates that the Canon 85mm f/1.8 ($340) is outperformed by the Canon 85mm f/1.2L ($1790); slightly outperforms the Canon 50mm f/1.8 ($80) and the Tamron 90mm f/2.8 ($489); and equals the Canon 100mm f/2.8 ($470) and the Canon 70-200mm f/4L @ 70mm ($1060). A very close competition, indeed. The Canon 85mm f/1.8 is an excellent buy, probably even a best buy. Unless you require the extra stop and the slightly better optical performance of the Canon 85mm f/1.2L, you might well be happy with the f/1.8 lens -- Not to mention the extra $1450 in your pocket! It does have rather soft corners when shooting wide open, particularly on a full-frame body, but as noted (perhaps to excess), this might actually be a benefit for portrait shooters. Stopped down slightly, it delivers very good performance for anyone, at a very good price. The marked asymmetry in the blur plot could be the result of a bad sample of the lens, but we've generally found that (apart from those showing obvious signs of physical abuse, which our sample did not), lenses that display assymetrical blur characteristics in our tests are generally those whose optical designs are very prone to minute misalignments in manufacture. Consequently, while you may see better performance on some samples of the 85/1.8, we suspect that a good portion of users will also see asymmetric sharpness characteristics similar to those seen here. The asymmetry does improve dramatically at f/2.8 and above, and portrait shooters (prime candidates for use of this lens) may not care too much about off-axis softness. Having sampled the delights of the Nifty Fifty on my EOS 7D, I thought that it'd be fun to go slightly longer and get the 85/1.8. I wasn't disappointed. Purple fringing can be quite bad at f1.8, plus the lens is very edge-soft when wide-open. Once stopped past f2.5 it blossoms into a wonderful bit of photo-taking glass. USM is fast, the bright viewfinder also a major bonus. In terms of sharpness and richness of colour/IQ it beats my 24-105L easily - in fact the combo of 50/1.8 & 85/1.8 has really got me thinking to I really need the 24-105L? I'm thinking not - just the 'red ring snob' in me makes me keep the L glass. Very highly recommended - just don't take pictures of chrome/silver-plated stuff at f1.8! I always love how 85mm looks for portraits. This one is my favorite 85 for canon system. I prefer this lens to the heavy & sluggish big brother (f/1.2)-though the 85/1.2 is an exceptional lens. It's fast enough for almost everything. It has the goodness of an 85 lens. Build quality is nice, and it has USM too. It focuses fast and accurate, even in dim lights. This is one of my favorite lens... before i replaced it with 100L mm macro. For the price, the build quality is good, if not outstanding. Focus ring is decent, but there other lenses with better focus ring. The focal length is great for blurring background, in which this lens shine even though it cannot matched the bokeh quality of 135L, but hey it's far cheaper. At 85 mm (which translates to 136 mm on APS-C body), this lens is not the most versatile. Filter thread size is easy to find; 58 mm and not the most expensive out there. This is a great lens, if you need 85 mm lens. The 85 mm f1.2 does cost you a fortune! This is really a great lens. I remain blissfully unaware of what life is like for 85L shooters, but I have a hard time imagining how much better it really can be. I guess an extra stop is important, but for 4x the cost I don't think I'll ever try it - the 85/1.8 is too good in so many categories. I really wish Canon could construct a lens of this quality at 50mm. For a cheapish EF prime on a 1.6x crop this is a nice focal range for portrait, nice bokeh. Also useful for Landscape, build quality is good for a non L, its a prime just get it already. Amazingly sharp from f2.8 in center and from f4 in corners on 5d. Beautiful colours, contrast, bokeh. At 1.8 little bit CA. AF is uncompromising = super quick and accurate. Close to the Canon EF 135/2 L. A must have lens for portraits. Definetely. I love this lens! Light, fast, and a great focal length - it's a smooth and efficient tool in my arsenal. I really hate the lens hood. I broke one of the clips the first day, and while I still keep it on, it is a constant nuisance. Yeah, it's got fringing wide open, but it's a small price to pay for such an excellent lens. If you are looking for an affordable prime lens with excellent image results, then this is the lens for you. All things considered, this is a great lens at a very reasonable price. Build quality is similar to the 50mm 1.4, 28mm 1.8, and 100mm 2, which is to say good, not great. The focus ring turns smoothly and the lens features a metal mounting ring, but the barrel is cheap plastic. At f/1.8, the 85mm is soft -- IMO unusable for anything but portraits, admittedly the lens' intended use. Sharpness increases rapidly as the lens is stopped down, and is usable by f/2.5. Autofocus is quick and fairly accurate, I've used this lens for basketball and tennis with mixed results. Probably the most frustrating characteristic of this lens is the minimum focus distance of .85m. I've often wanted to move closer to a subject, only to find that the lens will not autofocus at the intended distance. Thus, I replaced it with the 100mm macro in my kit and haven't looked back for any application. I bought this lens on a whim to give me something new to play with because a new 'L' lens I'd ordered hadn't shown up. It has since become possibly my favourite lens. It is now the fastest lens I own, and the only lens with which I find that 1/8000 shutter speeds sometimes aren't fast enough. It can be used in very low light. The image quality is nothing short of amazing. With some recent portrait work, I did a direct comparison with this 'old' lens and Canon's latest EF 100mm f/2.8L IS macro lens. The shots using the new 100mm macro lens were good, but the ones using the 85mm had the edge. It is extremely sharp and produces wonderful colour, contrast and bokeh. The AF is fast and accurate. With the wide aperture I don't find myself wanting or needing IS. The minimum focusing distance is 2.8ft, but add an extension tube to reduce the minimum focusing distance and you have a cheap - but very competent - entry level macro lens. Even with 100% crops of macro shots using a 25mm extension tube the 85mm f/1.8 loses none of its sharpness. With portrait work now, this is my first choice lens - even though I have 'L' lenses to choose from. I really can't praise it enough, and the more I use it, the more I like it. However, it is pointless trying to describe a lens using words and graphs. The only way is by looking at sample images. Excellent ratio performance /price until weather condition becomes adverse rendering the lens useless due to fog deposit on glass inside the lens. It seems that USM auto focus is acting as a pump. That did not happen to my "L" lenses; still working all day long in the windy fog of Asir Mountain last month. If you are serious of image quality, this is a cheap solution for Portrait with this range. Absolutely perfect. No lens compares at this price. The only thing missing on this lens is the red ring. I have taken shots with this lens on my 300 and now my 350 and almost all are keepers. The shots I erase are because of composition, not quality. As I use it mostly for portrait work, on a tripod, IS is not an issue. And it is an EF lens, so when I upgrade to a 5D, I will still be able to use it. I agree with all the positives that folk have to say about this lens. I use it with a 40D. If you are looking for a lens of this focal length stop reading reviews just go and buy it. After buying the 100mm f/2.0 and falling in love with it, I decided to get the lens everyone was suggesting for a good cheap prime, the 85mm f/1.8. While I am not disappointed with the lens, I see it as a 85mm f/2.2 because that is where the lens really becomes usable. Now f/1.8 or f/2.0 are not terrible, and if the light is so off that I have to use it or get a blurred shot, I will open this lens to the max and take the shot. But if I can get by with it I always use f/2.2 for the max aperature setting and I become very happy. If I could get the sharpness of f/2.2 with the bokeh of f/1.8, I would consider this lens unbeatable. Canon 85mm f/1.8 USM is probably the best value Canon lens. The quality of the image is very good, big aperture allow low light hand held shot and create a shallow depth of field. The auto focus is quiet and very fast. Build quality of this lens is very good, feels very solid and definitely a step up from kit lens. It is relatively short and light weight compared to general purpose lens (3.0" x 2.8", 15.0 oz. / 75.0 x 71.5mm, 425g). Application of this lens will be portrait, indoor sport (basketball, volleyball), art performance and candid photography. Wide open at f/1.8, this lens is soft but create a very nice 'bokeh' great for girls portraits. at f/2.8, the center of the image is very sharp, my favorite setting for general portraits and sports. at f/4 and above, the image is very sharp edge to edge, especially f/8 where you get the maximum sharpness. There is nothing that I can complain about this lens at this price point because it has very good built quality, excellent in low light especially freezing motion, and awesome for portraits. It worth every penny. I recommend this lens in addition to your general purpose kit lens. What a very pleasant surprise this lens turned out to be!! Sharp - Great IQ - Great Bokeh - Very fast focussing, and it's small and light. It easliy focusses on a downhill ski racer. I use to use a 135 F2 'L' when shooting Skiers, but it's usually too long a focal length when fitted on a 40D. The 85mm cured that problem and at a bargain price. I normally use it at F2.8, and at that aperture it's 'L' prime sharp. Not much else to be said really. A real surprise - a lens bargain that every canon owner should have in their bag. A good1st prime lens for all 'Zoom owners' to upgrade too. fast AF, very compact , verysharp, very cool color , almost distortion-free. best bargain lens if you need this forcal length. it is sharper than most of other lenses , I also have used the Nikon 85f1.8D and I think both are good but the Canon AF is much better due to its Ring USM. I dont see any reason to pay a lot more for the 1.2L2 lens when this cheap lens is so good already. the best candid street lens IMHO. An excellent portrait lens on a full frame body. Quite sharp all the way from f/2.8 to f/16. The ultrasonic ring motor is both fast and quiet, and since focusing is entirely internal, the lens is inherently sturdier than lenses with extending front elements. This is one of my favorite prime lenses for full-frame Canon bodies. It is compact and light enough to be very comfortable to use. I don't have the 100mm f/2.0, but apparently it's similar both mechanically and optically, so I'd consider that lens as a good alternative, if you prefer a slightly longer focal length. Another option to consider is the 100mm f/2.8 macro. While the macro has better sharpness, I find the wider apertures of the 85mm to be useful in some situations. I purchased this lens after reading many of the opinions here, and reviews. My first time out with the lens was an outdoor concert which it handled well. I have course have to learn how to zoom with my feet. The second outing was a bike race. Once I figured out that 2.8/3.2 are best for fast moving action, the pics were sharp and spot on. For portraits and bokeh shots, this lens is great. No problems there at all. The 28-135mm IS USM sits in the bag now, and th 85mm spends most of it's time on the 30D body. get it if you need this forcal length. there is no better lens than this , I sold my 70-200f4LIS to get this one since I needed a inconspicuous , samll lens for street and PJ work. Fast apeture, fast focus, sharp @ 1.8, Beautiful blur. I really like this little gem. It makes an excellent portrait lens. The hood is a must to cut flair and and richen colors and contrast. Excellent lens everyone should have one in their bag. Pros: Very sharp & contrasty, very fast & quiet ring USM, very useable wide open, great bokeh w/ an 8-bladed aperture, reasonable price. Cons: Slight CA at max. aperture, not at its sharpest wide open, also some vignetting at wide apertures even on a cropped sensor body. One of the sharpest lenses I've used, and the very wide maximum aperture makes this lens usable in low-light situations where using flash is not an option. In my experience, it seems sharpness peaks at around f/2.5-4, it improves little when stopped down further. The 8-bladed aperture results in a very nice, non-distracting bokeh for portraiture, although 85mm maybe a little too long when used indoors on a 1.6x FOVCF body. Overall, one of the best bang-for-the-buck primes in the Canon arsenal. Cost, sharpness, weight, quality of bokeh and colors, fast AF. CA at 1.8! Nothing else. It is no wonder this lens is highly respected by the Canon community. Although it does not have any special glass, it is amazingly sharp and produces a very beautiful bokeh. What is simply amazing, is its price. This prime is also lightweight and therefore can be easily added to your bag without having your back (and wallet!) suffer the consequences. The DOF at 1.8 is quite narrow, but in general the focusing is excellent. The CA at 1.8 is troubling, but easily fixed by software. By f4 the lens already peaks and the quality of the colors produced is surprising. This lens is cheaper than the comparable 100 f2 and can be used with either Full Frame or 1.6x sensors. There is just no downside here. This is my favourite Canon prime lens. Fairly compact, very good optics (even wide open) and quick and quiet in operation. It is not heavy either, which is an advantage when carrying lots of gear for long periods. The only worry is that the little catches on the lens hood seem a bit small and weak, but I have had the lens and hood for quite a few years now so maybe the impression is unfounded. the best lens for portraits u can get for that price. subject in focus simply pop out of the picture. creamy bokeh, very fast AF. working with a prime lens forces you to move your feet and look for your shot. this also enables you to find compositions you wouldn't get in a zoom lens while you're standing in place. a very creative lens that manages to get emotions out of the pictures. Very very sharp even wide open - I really don´t notice any improvement by stopping down. Great color and contrast. Creamy bokeh. Fast and very accurate AF. Very compact size and relatively light weight. I love to use this lens for portraits in studio settings, but also at informal gatherings to pick out faces from the crowd (I use it on a 30d). It´s also nice as a small tele solution for landscape shooting. It even combines nicely with my Kenko 1,4 TC - although some contrast is lost there, but the sharpness remains great, especially stopped down a little. - my copy seems to overexpose outdoors, which can be easily handled with -2/3 EC. Fantastic lens for portraits and other outside work. Kind of long for inside shots on a 1.5x or 1.6x cropped camera. I don't worry about the CA issues because my raw converter program takes care of that for me. Excellent lens all around. The perfectr portrait lens is, dollar-for-dollar, better than it's "L" counterparts for general portraiture. Lightweight, fast focussing, and WOW bokeh. This is a very popular low-light prime lens. It has all the sharpness that one expects from a prime lens and USM focusing is always fast and accurate. The only downsides to this lens are a tendency for CA in wide open shots and a slightly long minimum focusing distance that can be a little frustrating. This is my favorite lens in my arsenal. The lens is usably sharp wide-open and gets better very quickly. OOF areas blur wonderfully, and combined with a shallow Depth of Field, this lens makes a superb portrait lens. Build quality seems tough, and I haven't had any issues there. The manual focus ring is extremely smooth and has a very good feel. My only complaint of note is that this lens on an APS-C camera, like a 20D, makes shooting anything other than tight headshots require quite a bit of space. I work in fairly limited studio space, and this makes it a second-choice when shooting even head and shoulders, because I just can't back up far enough. I highly recommend this lens. too narrow now on a sub-frame body. I take a lot of indoor shots (church events, etc) where the use of flash is inappropriate (don't want to draw attention to myself) so I needed a fast lens for candids of the people. I was starting to feel this lens was not narrow enough on my Film camera, but now that I got a sub-fram dSLR it has become narrower. Not a bad thing but I need to recalculate my distances from my target as I had this lens for about 3 years if I remember. The sharpness is incredible and for the price you can't beat it. I mostly shoot it stopped down to 2.0 because at 1.8 it is slighly soft. One thing is that I do notice a little CA when wide open. Nothing to really be bothered about if you're going to be staying on the web or priting 4x6 but it will be noticeable if you get to the actual size. Focusing is excellent, fast, and quiet. What else from USM? This is definitely a keeper if you take a lot of candid shots of children/people/etc. Going from FF film to sub-frame digital made this a more telephoto than a portrait lens but... oh well. I use this 1.8 and a 35mm 2.0 for all of my indoor church shots now. They complement each other well and are fast. The colors are also amazing. The people always comment how the colors are beautiful and shots look amazing (they come from P&S and they don't know what a good bokeh does to an image). I can only say that I have a good lens as I don't do anything special. for excellent portrait shots, get a good tripod and the wired shutter release cable, not only prevents shake (with mirror lock up) but your hand won't be all in weird shape (and you'll look slightly cooler). Very good lens. I bought it for indoor sport (karate), and it is very good for it on a 400D. I had one or two case of strong CA using it outside and wide open, but never got any when using it indoor, even with white karategi against black wall. It is just long enough to stay away from action and get nice shots. Sometimes, it is a bit too long, for example if you have to take a group photo. Great lens. I can't really add anything that hasn't already been said. It's also a great value. Good price for a lens that performs this well. Everything about this lens is great, and definitely worth buying, except for the purple fringing. In high contrast scenes (think trees against white sky, or specular reflections) it is *really* bad. So know to avoid those, and everything will be fantastic. You cant ask for much more from a lens in this price class. It is very shap, fast, FT manual focus, USM. Images are very good.. excellent in fact and with the 1.8 it is a pleasure in low light. This one is a keeper in my book. I have bought and sold others but this one stays. I use an XT so it is equivalent to a 136 (approx.) 1.8 lens. I have used it at weddings where the light was very poor and it produced good images. I don't own the lens, but tried it extensively before deciding for it's longer twin, the 100mm f2. I liked it very much for it's IQ (sharpness and colors), but also for it's compact size, perfect on the 350D (Rebel XT). The fast f:1.8 was great for my use (indoor portraits and concert pictures), but this lens was too close to my EF-S 60mm macro, and I finally bought the 100mm which is great. The only negative comment I could make on the lens is its quite pronounced CA in high contrast zones (purple fringing) wide open, and still visible at f2.8. My 100mm seems less affected by the problem. Nevertheless, it appears only in some particular situations, and can be corrected in PP. If you are looking for a moderate telephoto lens: BUY THIS ONE!!! Equivalent to a 135mm lens on a dslr, this is one outstanding lens and well worth the money. At f/1.8, it has the speed for virtually any kind of shooting. I'm not sure why Canon also makes an f/1.2 L, but I doubt you will find much reason to spend $1,400 more for a faster lens than a f/1.8 at this focal length. Excellent optics & build quality. This is a wonderful lens. Any time I need a short telephoto and a top-quality picture, I reach for this lens. usage: mostly portrait photography on a Canon 5D or 1DsMkII. This is the first lens I reach for when I want to take potraits. The sharpness is very good at f/1.8 (I rarely use it beyond f/2.8) and the bokeh is amazing. The autofocus is fast and accurate, build quality is good. One of the best values in the Canon lineup. The only significant downside is the chromatic aberration, but it's only a problem in high contrast scenes. There is a fair bit of vignetting at 1.8 (full frame) and it doesn't focus as close as I'd like, but these are fairly minor issues for me. vs Canon 50/1.4 - 85/1.8 is sharper and has better bokeh. I prefer this focal length for portraits. The perfect people-lens for FF and head-shot lens on APS-C. The AF on this lens has to be among the fastest for any lens of similar focal length. Wide open the images are just a tad bit soft, compared to Canon's better lenses. Nevertheless this lens has never left me wanting. Unfortunately a lens hood is not included and when you buy the hood you'll wonder why such a small piece of plastic costs so much. The only downside is that the closest focusing distance is not short enough. This is a lens I've used for years and feel it is unlikely to ever leave me. Low magnification, far Minimum focus Distance. The AF certainly is fast, but It's not instantaneous. It's Sharp and Very good wide open, but there are CA issues. The very long minimum focus distance and low magnification is quite annoying if you are a macro lover. If you shoot sports or other fast moving subjects this is an outstanding lens. It's good for portraiture if you like the focal length. This lens does seem as sharp as the Nikkor 85 I once had, but it's a great lens with exceptional build + focus. I really love using it. 2. it doesn't offer as much magification as an 135L or 85L making some real world shots an issue ... often, I just want to get closer, but this lens won't go there. Anyone considering this lens should also consider the 100 usm as well. This is a remarkable value in an inexpensive lens. Great for available-light shooting and portraiture. Bought it to use on Canon 5d, and its image quality seems to be a good match for the full-frame sensor. The Canon 85 1.8 is by far my favorite lens. It is a good focal length for portrait shooting. You will be able to get very good tight head shots. This is a very good low light performer as well. Pictures a pretty sharp wide open and extremely sharp at 2.8 as well. The bokeh is silky smooth and the picture color is stunning. If there is any complaint... I have experienced to what appears to be some purple fringing or CA(chromatic abberation) especially on bright areas of the picture. An explanation that I received from other photographers is that is a artifact from the camera sensor itself. Either way, I feel this is a wondeful lens and is sharper than any other lens that I own. I my current collection is the Canon 17-40L, Canon 50 1.8, Canon 28-135, and Canon 200 2.8L MkI. I pair this lens with Canon’s 1D Mk II and utilize it primarily for portrait and landscape work. I’ve also had opportunity to utilize this set for architectural work, but not too extensive to this point. The 85mm is a great lens, a wee bit heavy (but I like that) for its size, solidly built and frankly, sharp as a tack. In my portrait and micro-scape work, I’ve had plenty of opportunity to use the wider end of the aperture range. I find myself working in the 1.8 to 5.6 range primarily, with f8 coming into play on occasion. In all instances, the image produced is sharp and contrast from corner to corner. Wide open, the bokeh is wonderful and buttery smooth. As a landscape lens, I have utilized the full range of aperture, and not been disappointed at all. The depth of field at f8/f9 is great and the image is razor sharp. Contrast could not be better with this lens! The controls are easy to operate and the placement of the AF/MF switch is fine. I’ve had opportunity to use the 85’s lower light range brother on occasion, but have never had opportunity to regret going with the 1.8. My personal preference is for the 1.8, but everyone has an opinion. To sum up… This is an excellent lens and well worth the cost. For portraits, it’s opened up new horizons with me. As a landscape lens and the MkII’s 1.4x EFL makes a great little landscape lens. Feel free to write with any questions or thoughts you may have.